If you have used the 2007 or 2010 version of Microsoft Word, you will discover the version 2013 to be an improvement that enhances the user experience with added features and functionality. 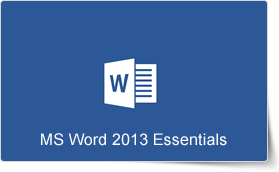 This Microsoft Word 2013 Essentials training course from PD Training is intended to teach new and experienced users how to benefit from the new features of MS Word 2013. This course will teach you how to add different page borders, effects & watermarks, change themes, apply bullets & numbers, insert tables, charts, equations, SmartArt & screenshots and much more. This Microsoft Word 2013 Essentials training course can be delivered at your premises by one of our expert local or international trainers or live online using our HIVE technology. Word 2013 Essentials Training Course is the fastest way to gain a comprehensive understanding of all essential features of Word 2013, and gain skills in using it expertly. Word 2013 Essentials Training Course covers all important features of the word processing application that are necessary for using it expertly. During the training course, participants gain understanding and use of the various new features of Word including formatting tools, working with paragraphs, formatting the page, and working with art and objects. The course provides comprehensive training in a short time, and is designed for developing practical skills that benefit participants in their work.